India's Most Successful Entrepreneur is the curated collection of country’s finest and the most successful entrepreneurs. It's dedicated to the men and women who are epitome of entrepreneurship, inspiring the generations to come. Entrepreneur life journey to success will be showcased in this coffee table book which will be one of a kind Entrepreneurial handbook and will be made accessible to the entire Entrepreneurial community and business fraternity, who’s who of the world and top notch marketers and Brand Managers to take note. So, come share with us your great story by nominating yourself to get featured in the Ultimate Entrepreneurial Powerbook the world has been waiting for! 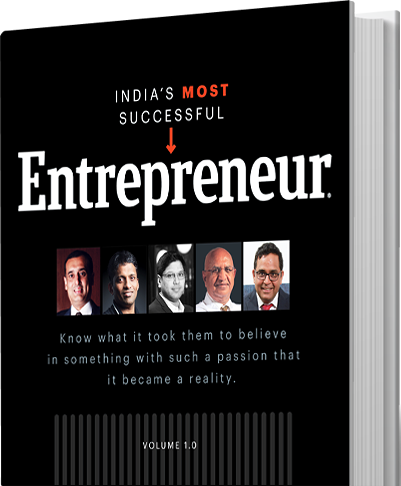 Both a growth manual and a masterclass in entrepreneurial thinking, India’s Most Successful Entrepreneur @Entrepreneur is the go-to book for entrepreneurs - big and small. Going insider to insider – cover-by-cover, this is the first ever book on star entrepreneurs told through the prism of Entrepreneur magazine. The book looks towards the future, with the best-ever collection of original thoughts, hard-hitting experiences and ideas coming from India's leading business minds, most influential entrepreneurs and CEOs, revealing their most closely held advices. With learning, ranging from - selecting the right idea to finding funding and overcoming inevitable obstacles in an economy demanding change, India's Most Successful Entrepreneur @Entrepreneur is not just a collection of interviews but a really deep, and broken down analysis, just what it takes to get there and all of the lessons these entrepreneurs have learned along the way. Think of it as the tales from the trenches, as told by those who have hacked and hustled their way to the top. We find out for you that pivotal moment and, that decisive step that made them what they are today. The contributors to this book will attest - it takes passion, commitment, and a healthy dose of hustle to make it to the top; as each of them is living proof of how it can be done. India's Most Successful Entrepreneur Coffee Table Book will be a specially designed research based compilation which will be like an assortment of various business aspects and impact high points of participating brands seamlessly stitched together as some of the most riveting success stories. The evaluation and synchronization of the same will be done based on the parameters like Financial Growth, Human Capital, Innovation, International Orientation and Corporate excellence. These Leaders will be handpicked taking in consideration their contribution in their respective businesses and industries. The massive media promotion will be strategically done to highlight the prominence of this signature of excellence. The coffee table book will be presented to the top hierarchy, who’s who from the Entrepreneurial Community and business fraternity. It would be made available across popular news stands in the country. How to Join the League?